Scuba Froggy is a French dive centre based in Senggigi. It offers diving and snorkelling in all the best diving spots around the Gili Islands (Trawangan, Meno and Air), as well as around the South Lombok waters. The centre caters for all levels and offers training with three different schools: PADI, FFESSM, and SSI. 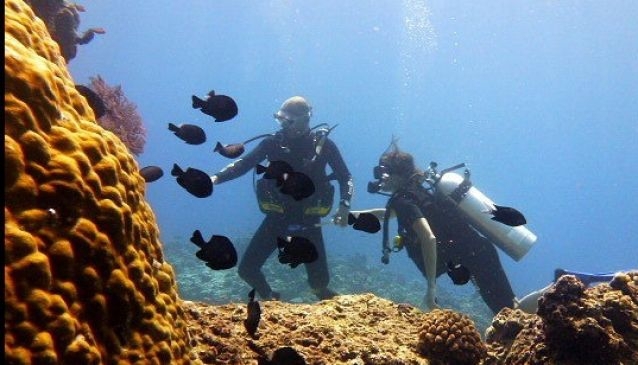 Within Lombok's waters you'll witness vibrant coral reefs, shipwrecks, turtles, and all kinds of tropical fish such as surgeon fish, butterfly fish and clown fish. A dive trip will usually last for the whole day and runs from around 9am - 4:30pm. The best time for diving on the Gili Islands is from April until the end of December. January to mid April is also good but visibility may be poorer and water temperatures cooler. If you're heading to South Lombok, the best time for diving in Kuta is from the middle of September until the end of May. Out of this period dives are better in Sekotong or the Belongas areas.